Since his conception, the life-story of the mysterious mutant and comic book super-hero known as Wolverine has fascinated fans, constantly confounded by the cloak of secrecy and contradictions his creators at Marvel Comics construct for their readers. Now, in an attempt to revitalize the X-Men film franchise, Marvel and 20th Century Fox gives fans another origin story of their favorite mutant to debate about, and they did an alright job. Look, I dropped out of reading X-Men comics years ago, and I've only recently seen the 3rd X-Men movie on television, so I'm not really sure how everything presented in Wolverine matches up with the comics. I have some familiarity with the characters, but not exactly with their powers, or, their origins, so I'm not going to argue what Fox got "wrong" with this story because, like the entire comic book franchise, canon and continuity can be very fluid when talking about Marvel's mighty mutants. While the movie didn't exactly have a lot of great moments, I did enjoy the opening credit sequences of Logan (Hugh Jackman) and Victor, aka. Sabretooth (Liev Schreiber) unleashing their animalistic tendencies through war, from the American Civil War to the Vietnam War. Jackman is playing Logan for the fourth time (a first in the age of comic book super-heroes), and it's obvious that he's very comfortable in Wolvie's bushy sideburns. Honestly, can you think of anyone else that would be right for the role? 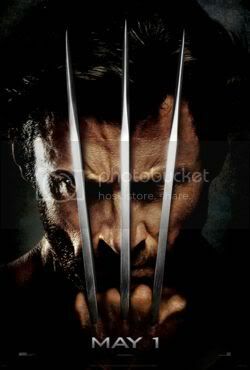 The basic plot, besides telling how Logan gets all adamantium-ed up and all, has something to do with some U.S. colonel (Danny Huston) and his plans to create the ultimate mutant to help hunt down all other mutants. I think. Anyway, chaos ensues and mutants are on the loose, and "brothers" Logan and Victor are forced to face-off, then team together (how very comic book-ish) in a battle that brings down Three Mile Island. I liked it. It wasn't anything special, but I did enjoy seeing Gambit and a young Cyclops make appearances. Even the cameo by Professor X. was an enjoyable highlight. All in all, X-Men Origins: Wolverine earned a B-. How do you revamp a franchise? Time travel and a Star Wars fan, of course. 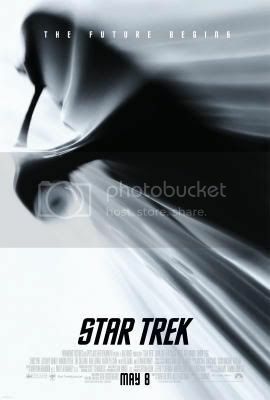 Mystery/Conspiracy television guru J.J. Abrams takes the director's helm of what turns out to be an alternative universe of what Trekkies already know about their beloved franchise. Or what they think they know. Going into the details of the plot, I'll just quote Yahoo: "The fate of the galaxy rests in the hands of bitter rivals. One, James Kirk, is a delinquent, thrill-seeking Iowa farm boy. The other, Spock, was raised in a logic-based society that rejects all emotion. As fiery instinct clashes with calm reason, their unlikely but powerful partnership is the only thing capable of leading their crew through unimaginable danger, boldly going...." Yeah, yeah, yeah, heard it. Even that summary isn't really accurate. Basically some bitter Romulan (the emotionally-based version of the Vulcans) is out seeking revenge for the accidental destruction of his world by an aging Ambassador Spock (Leonard Neimoy) by going back in time and destroying Vulcan, by injecting it with 100cc from a big blob of red ink. Yes, even Pandora is going "Huh?" I enjoyed Chris Pine's performance as thrill-seeking "farm boy" Kirk, John Cho's swashbuckling turn as Sulu, and Karl Urban's spot-on turn as "Bones" McCoy. While the casting was perfect, I wasn't all that impressed by Zachary Quintos' performance as Spock. Zoe Saldana as Uhura was nice eye-candy, but the whole romantic plot between her and Spock seemed false and... wait for it... illogical. I guess you can call Anton Yelchin's performance as Checkov, despite his hair, was cute, he puts forth a far better performance as Kyle Reese in Terminator: Salvation. And what the hell was Winona Ryder doing in this movie, anyways? The movie was colorful, the explosions were pretty, and the effects were good (was that the creature from Cloverfield chasing Kirk on Hoth that ice planet place? ), but it was the constant lens-flares that drove me nuts, if not blind. Abrams has admitted that there were a ridiculous amount, but he explains that away by saying that those flares were a representation of how bright the future was as if The Future was a whole other character. Really? The destruction of an entire planet and the billions of people on it equals a bright future? Someone ask Princess Leia what she thinks of that theory. This was a coin-flip for me, and I think the lens-flares tilted things to one side. J.J. Abrams' Star Trek gets a C+. Look for reviews of Angels & Demons, Terminator: Salvation, and Up in the near future. Hmm, I agree with your overall comments, though I probably would have scored it higher. I agree that all the romance was pretty fake and was probably better avoided altogether. I think what Quinto did get right was a very Spock-like manner; constantly a furrowed brow, very few emotions, but ultimately somewhat heroic. Really, there's only so much you can do when the original series had such bad acting to begin with. I actually disliked Kirk; something about swashbuckling characters that become heroes bug me. I mean Han at least keeps the raggedy space suit and constantly looks in need of a shower; the whole Kirk becomes a great leader because he knows how to break the rules just seems too fallacious. I'm kind of interested in Terminator now, since you say Yelchin was good in it. And I agree the overall plot was recycled at best, and pretty contrived. I'd give Trek a B for no other reason than it's not boring and it has pretty good effects. It's a bit overrated but I've seen a lot worse.